They said he was crazy. Ponce de Leon went searching for the Fountain of Youth. He wanted to transform his old, weary and diseased body to something fit and youthful. He failed. They said he was crazy. They said they were crazy. Bob Livingston and Joe Tutrone sought to acquire Emtex, Inc., an old unwieldy group of Chelsea Industry divisions that the conglomerate wanted to spin off Today, after a year of ownership, the new Emtex is trimmer, more aggressive, and best of all, profitable. Emtex received its origins from the old Novelty Bias Binding Company founded some sixty years ago to sell trimmings to the apparel trade. Novelty Bias Bindings was the “granddaddy” of all the Chelsea Industries companies founded by the Casty and Faneuil families. Emerson Textile, from which the EMTEX name was later derived was founded by these same owners some fifty years ago to sell to the rubber fabric footwear companies that were then just emerging in the New England area. Through time the empire grew, adding Hope Webbing and Maynard Plastics among others to the list of companies. When the company – now called Chelsea Industries – went public in 1967, it had an annual sales volume in the $8-10 million dollar range, almost all of it footwear related. By 1984 Chelsea’s sales had grown to nearly $200 million. Although other footwear suppliers had been added to the roster, the footwear division accounted for only 30% of sales (22% of earnings) of the conglomerate. A decision was made to “spin-off” some of the footwear companies and the current management was given first crack to purchase via a leveraged buyout. Robert Livingston and Joseph Tutrone accepted the offer to purchase the Emtex division. During this transitional phase, the “slimming down” of Emtex began. The company eliminated a number of product lines that required large investments in inventory. Among them were duck materials for canvas footwear and the GF /Emtex line of fabrics for women’s fashion shoes. 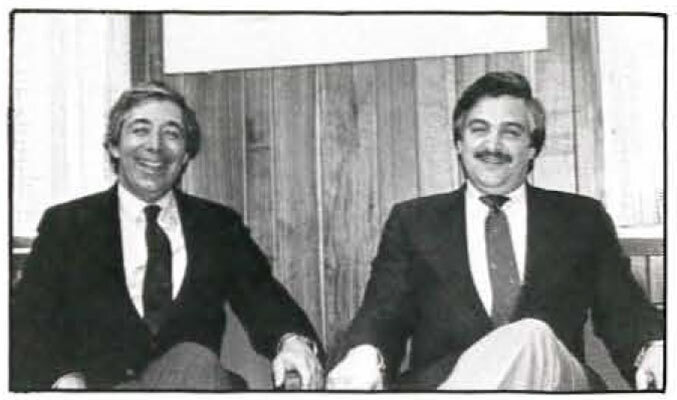 On April 28, 1985, Livingston and Tutrone signed the papers that made them owners of Emtex. Livingston had joined Emerson Textile in 1962 and had worked his way up the ladder to division president. Tutrone, on the other hand, was practically born into the company. His father had been head of production for Emerson and was the company’s oldest employee at the time of his death in 1973. Joe officially joined Emerson a year later and quickly worked his way up to the position of V.P. Sales of the Emtex Group. Why did two relatively young executives want to buy a company that Chelsea Industries wanted to get rid of? We figured it was a good business for two young entrepreneurs,” Livingston said, “but it was not the growth business that Chelsea wanted. Basically, it came down to a difference in corporate philosophy and investment payback. Their first fiscal (11 month) year was “better than expected” said Tutrone. Sales were in the “$7 million range” with a similar projection for next year. 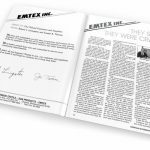 The “new” Emtex employs around 80 people at their Chelsea, Mass., headquarters, including Dan Schaeffer, sales manager for the Emerson division, and Jerry Gladstone who holds the title of National Accounts Manager. The company is also represented by a network of independent manufacturers reps throughout the country. Though Emtex is slimmer, the business is still complex and their product line varied. Under the Emerson Textile name the company manufactures bias bindings and trimmings for canvas and athletic footwear as well as for slippers. 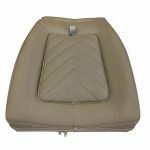 Emtex has the ability to do all sorts of fabric combining operations, including flame laminating, cement combining, and spreader coatings. Various knife over roll coating equipment allows the company to apply heat seal, tie coat, and non-fray coatings as well as pressure sensitive and latex adhesives. The Sun Products division makes decorative heat transfers and decals. It has its own in-house art staff to provide all the necessary design work. 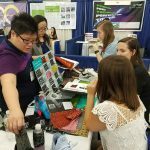 Emtex is also a sales agency representing a variety of other companies including Hope Webbing (shoe laces), Tapecraft (narrow woven fabrics), Elastic Corp. of America (narrow woven and knitted elastic products), all of whom were former Chelsea companies. In addition, Emtex represents Twiss Associates of Darien, Conn., to selected accounts. Twiss is also a “spin-off,” being the former canvas footwear and shoe fabrics department of West Point Pepperell. The company makes canvas footwear fabrics. Is their life after Chelsea? 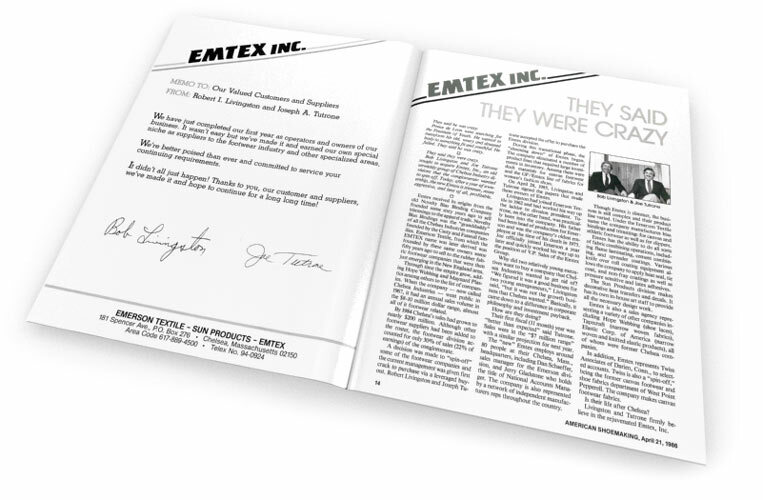 Livingston and Tutrone firmly believe in the rejuvenated Emtex, Inc.